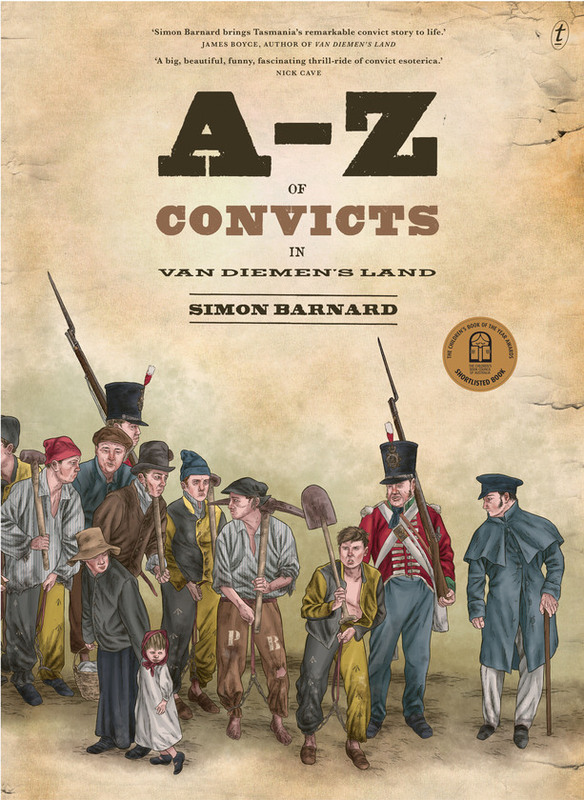 A - Z of Convicts in Van Diemen’s Land is a children’s picture book by Simon Barnard, published by Text Publishing, 2014. It has the distinction of being on the CBCA short list for the Eve Pownall Award for Information Books. It has also received the coveted Book Chook Feather of Approval for being one of the most visually intriguing and satisfying books I know. Seventy-three thousand convicts were transported to the British penal colony of Van Diemen’s Land in the first half of the nineteenth century. They played a vital role in the building of the settlements, as well as the runningof the newly established colony. Simon Barnard’s A–Z of Convicts in Van Diemen’s Land is a rich and compelling account of the lives of the men, women and children who were transported to Tasmania for crimes ranging from stealing bread to poisoning family members. Their sentences, punishments, achievements and suffering make for fascinating reading. The book is divided into alphabetised theme pages, with each page offering intriguing snippets that might well become prompts for children’s further reading. Some of the snippets are gruesome. History can be! All are actively written to grab children’s interest, and with quirky facts on subjects from Absconder to Zanyism. I love that Barnard has researched what may well have been thousands of dry-as-dust artefacts and brought them to life for the reader. I can only imagine the painstaking care that has gone into choosing what to include to give kids an overview of this period in Australia’s past - and what to leave out. By the end of the book, I really felt I had gotten to know so many of the characters Barnard introduced because of the fascinating visual and textual details. Visual detail certainly abounds in Barnard’s depiction of convict life in Van Diemen’s Land. Rich browns, greens and sepia tones on an aged manuscript background enhance the authenticity of the illustrations. I know children will appreciate the variety of image types - maps, cut-aways, cameos of architectural features, portraits, scenes etc and the way Barnard has used his own imagination to portray what he has researched. This is the sort of book kids will want to share and pore over. The fact that it’s twice as tall as a “normal sized” picture book, makes A - Z of Convicts in Van Diemen’s Land also readily accessible to teachers and librarians sharing with a group. You’ll find excellent teaching notes available from Text. They certainly increase the value of this already valuable book to any library - primary and high schools included. Would you like to read more articles at The Book Chook related to Children’s Book Week in 2015? Check out Activities for Children’s Book Week 2015, Children’s Book Week 2015 - Challenges for Kids, Children’s Book Week 2015 - Ideas for Performance, Children’s Book Week 2015 - Ideas for Display, and Guest School Visits in Children’s Book Week. What a brilliant find, this one. Thanks for sharing, Susan. You will love it, Richa!